English Tea Shop’s vast spectrum of gourmet teas will always leave you cheerfully surprised- from the classic English Breakfast Tea to the titillating Tisanes, all packed in lush Tea bags or within the most luxurious gift tins ! English Tea Shop is built around the concept of Value Sharing. In fact ETS believes that value shared is value doubled and it directly links sustainable development with long-term growth. At our company, we do this by applying the principle of Creating Shared Value (CSV); a revolutionary approach developed by Harvard Business School professor Michael Porter that businesses such as our own are putting into practice with exciting results in terms of growth. Through the plethora of projects we launched in rural Sri Lanka, we encourage our farmers to relive the old aged farming practices. Our teas and ingredients come from such small farmers in limited quantities, grown without chemical fertilizers or pesticides. We are committed to recognize and to tell the world how these small farmers make a huge impact on sustaining the planet’s natural eco system for many generations after us. We pay them a premium on top of the Fairtrade price to make sure they can farm in the most sustainable way possible. Not only that, through Creating Shared Value concept, we take measures to uplift the wellbeing of the farmers and their families. Once the ingredients come into our manufacturing facility, our team of experts combines them to create just the right balance of yummy flavors. After that our tea is hand packed, reducing our carbon footprint. From there it’s a hop, skip and jump over the sea and across the globe - into your cup. All agricultural ingredients are organically grown and processed. 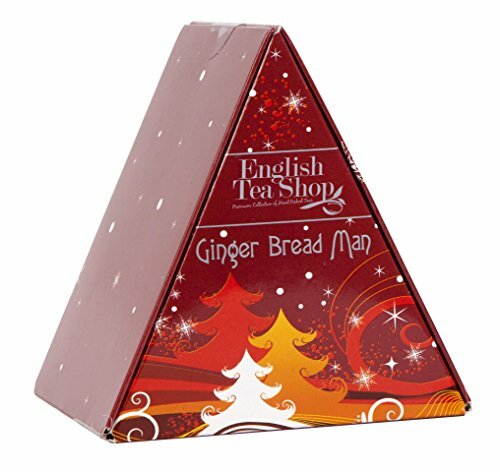 If you have any questions about this product by English Tea Shop, contact us by completing and submitting the form below. If you are looking for a specif part number, please include it with your message.